Do you have an extra spot on your couch for a sweet old pal like Marco? He is looking for a home to spend his best years in. He will return the favor with endless snuggles and companionship. Handsome Jake is looking for love. He is a big boy weighing in at 65lbs, however Jake thinks he is a tiny little lap dog. Our vet estimates him to be about 2 years old. Jake would benefit from an experienced dog owner that can provide some training. We are looking for an adult only home for Jake as we do not know anything about his history. If you’re a family on the go, go, go and want a companion who will match you step for step, young Brady should be your go-to guy. Just a pup at ten months old, this Jack Russell Eskimo mix is a lively 37 pound bundle of unadulterated joy and energy! Brady would appreciate a guardian who is willing to help him learn how to harness his exuberant puppy ways so that he can become the model canine citizen he knows he can be. Puppy training classes and at-home follow through should be just the ticket to get Brady to the head of the class! Having Brady by your side as your jogging and hiking pal will make for endless hours of happy trails. *Brady has lived with children. *Brady has played with other dogs. Alfredo is a loyal companion. He loves long walks, romping around in the yard and playing with his toys. He has stolen our hearts and can’t wait to steal yours too! Seven-year old Yorkie, Rudy, is as sturdy in his great sense of self as he is in his compact, little body. He knows who he is, and what he likes! One of the things he would like most of all, though, is to have a new home to share with adults-only who are okay with his sure-footed confidence and support his somewhat quirky ways. This super senior likes to take care of his things and appreciates it when his people are supportive of his need to safeguard his stuff. At the same time, Rudy will be happy to take care of you too! He’ll join you on lovely walks and fun drives in the car, and, afterwards, kick back and relax with a cozy snuggle in your favorite chair. Rudy is always up for a treat too! If a stellar companion is what you need, Rudy’s your guy. *Rudy has lived with a cat. The old saying “You can’t see the forest for the trees” is quite apropos when it comes to our boy Forrest, aka Forrest Gump. If you feel that your life is overrun with details and that you’re sweating all the small stuff all the time, do yourself a favor and come meet Forrest. This guy will help you reset your happiness meter in no time flat. An easy-going sidekick, Forrest is all about embracing life with enthusiasm and joie de vivre. This down home guy, with his homespun good looks, is just a happy-go-lucky, perennial kid at heart. Need a fun-loving pal to liven up the day-to-day humdrum as well as a “chillaxin” buddy at day’s end? Then, look no further. With boundless optimism, he marches through life only looking for the best. Even though our boy is a sweet, happy goofball at heart, Forrest also knows the importance of good manners and dignified behavior. Forrest just celebrated his 7th birthday. Leo is one handsome dude, with his glossy, smooth tricolored coat and boyish good looks. And that expression on his face? It’s Leo wondering if you’re the one who will take him home for a wonderful life together. Leo can just imagine those walks where you and he explore the adventures along the way and get your outdoor exercise — so healthy and fun for all! Then he pictures you both settled in afterward, relaxed on the couch, doing not much of anything. A Treeing Walker Coonhound mix, now 12, Leo is hoping to get lucky — after being pretty unlucky for a while. 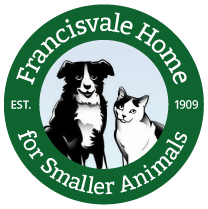 He was rescued from a dog hoarder and taken in by Francisvale Home for Smaller Animals in Radnor. It’s been a long wait, but he’s still confident that someone will come along soon and see how special and deserving he is. He holds back at first until he gets to know you, but once you know Leo, you’re bonded forever. He loves his dear friends with all his heart. His other favorite thing: after a walk, flopping lazily in the sun and falling asleep – he’s working on his tan! Leo is a great companion — sweet and delightfully goofy. When he runs, he looks like he’s all legs and makes the Francisvale volunteers who walk him laugh affectionately. Can’t you just see it? You and Leo? He’d like to be your only pet; so here’s hoping! Let’s get started!